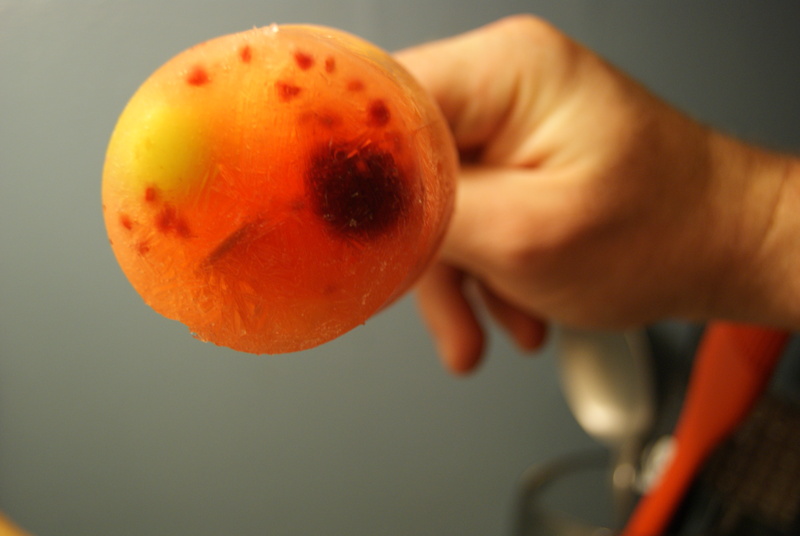 Frozen Boozy Fruit Pops. Or Sangria Poptails, If You’re Feeling Fancy. And we’re always feeling fancy here, aren’t we? Oh, you’re not? Well, this is uncomfortable. Anyway, let’s just fake it ’til we make it, shall we? Oh, you can’t? Why are you being so difficult today? You know what you sound like? You sound like a person in need of sangria. Frozen sangria. It’s on a stick. Just trust me. Yes, this is another entry from The Party That Ruled The Roof (Bacon Sundae Party? Ringin’ a bell? Yay! ), and it is so. worth. making. Basically, I wanted something cool (literally and figuratively, because I am soulful and deep in that way) and sophisticated (to make up for the fact that I am not) that our guests would enjoy and not spill on themselves and on my white tank top. Enter the sangria pop! It’s fruity, it’s light, and it’s BOOOOOOZY! Let’s roll, adults! In a medium-sized bowl, combine 1 cup of your pinot grigio with all of your chopped fruit and set aside for about 20 minutes. 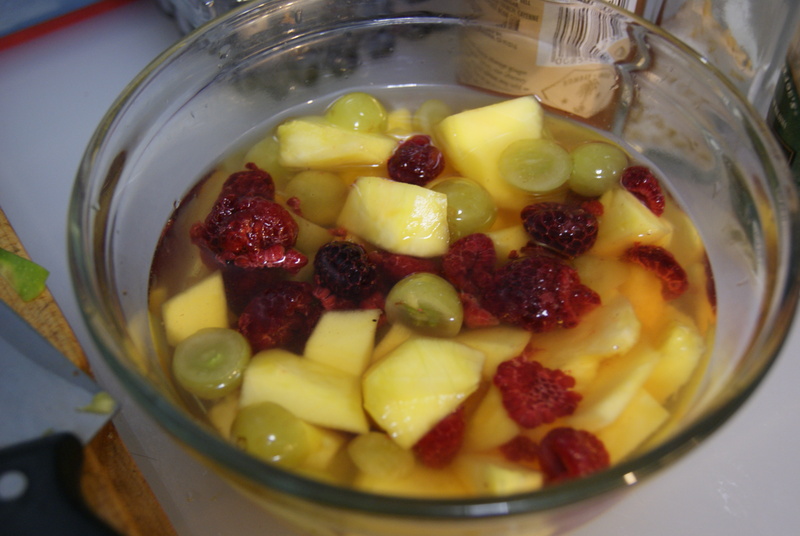 Once the 20 minutes is up, strain the fruit out, making sure to save the now-infused wine. Evenly distribute the chopped fruit amongst your popsicle molds/Dixie cups. Then, take your fruit-infused cup of wine and mix with 1 cup of your Orange Mango Peach Juice and lime/lemon juice. Pour into molds, evenly distributing among them. Top each mold off with the remaining 1/2 cup of pinot and remaining 1/2 cup of juice. Lightly stir, then send into the freezer for about an hour. 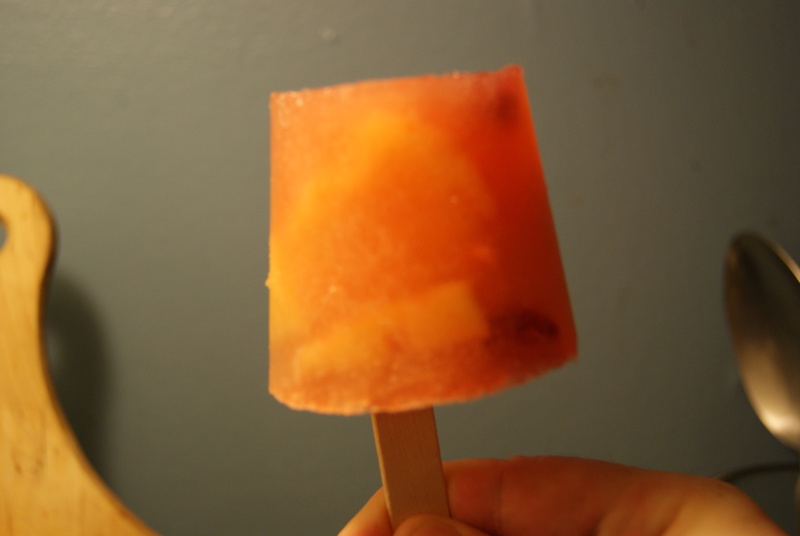 When the pops begin to freeze, insert a popsicle stick into each, and allow to freeze completely, at least three hours. So, what was the consensus? First, it was… wtf?! Then it was…oh…oh, yes, new friend, hello. Then it was…hazy. These are pretty strong, so make sure you’re not downing one before operating a tractor or anything. For reals. Honestly, these were YUMMY. I “accidentally” made too many and now have a freezer full of these, which, you know, makes life super difficult/delicious. HIGHLY recommended. ← It’s Summer, So We’re Trying To Eat Healthily. Scratch That. We’re Trying To Eat Bacon Sundaes.